I had the honor of preaching for Pastor Charles Webb who pastors the Anderson Baptist Church of Anderson, Indiana today. He and his dear wife Wendy are graduates of TEXAS BAPTIST COLLEGE. This dear couple has been here for 5 years and their church has grown from 7 to almost 300 every week in attendance. I preached tonight on “Everything Rises Or Falls On Followship.” The altars were full and the people were very responsive. 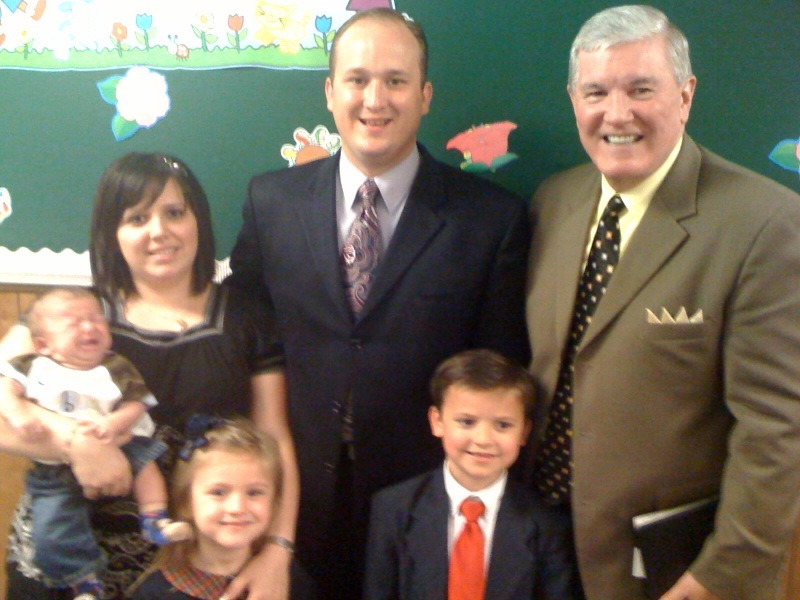 In the picture you have Pastor Webb, his wife Wendy, son charlie, daughter Madison, and 8 week old Cole. The baby is facing some real medical problems and will be taken to a specialist in the near future in Indianapolis. Please pray for Cole. This is a wonderful family and a great representative of not only TBC but especially our Lord. By the way you don’t have to worry about putting a question mark on the KJB at TBC. GOTTA LOVE SERVING THE LORD!